Astor Piazzolla was born on March 11,1921 in Mar del Plata, Argentina. When he was 8 years of age his father gave him bandoneon which he had bought at a pawn shop for 19 dollars. Bandoneon, a close relative of the accordion, became Piazzolla's first instrument. He preserved his love for it till the end of his life. Young Piazzolla revealed astonishing musical talent. He made his first record at the Radio Recording Studio in New Yourk when just 10 years of age. Two years later Pizzolla takes piano lessons from the Hungarian pianist, Bela Wilda, who was a student of Rachmaninov. It was Wilda who discovered Bach for him. In 1936 Piazzolla begins playing in orchestras with exclusive tango repertoire. The world of tango became his second grand discovery. Two years later Piazzolla moves to Buenos Aires. He plays in orchestras and continues his musical education taking lessons from a famous composer Alberto Ginastera, and from a pianist Raul Spivak. The formation of Piazzolla as a professional pianist commences in 1943 with writing of his first classical composition, Suite para Cuerdas y Apras. And in 1946 he writes his first tango, El Desbande. However, three years later Piazzolla abandons the genre of tango and ceases playing in orchestras. He concentrates instead on studying Bartok and Stravinsky, and he listens to jazz. In 1950 he comes back to tango but this time on an entirely different conceptual level. In 1953 Piazzolla presents a three part sympony work, Buenos Aires, for the Fabien Sevitzky competition and wins the first prize. In 1954 he moves to Paris. Since 1958 he lives in New York and since 1970 in Europe. His music sounds and is recorded in France, Germany, and Italy. Between 1970 and 1978 Astor Piazzolla writes such popular compositions as Libertango, Suite Troileana and many others. In the course of the next ten years Piazzolla's popularity reaches its peak. Concerts with his music are held in Europe, South America, Japan and USA. In 1982 he writes his most famous composition, Le Grand Tango, and dedicates it to Mstislav Rostropovitch. The Russian maestro first performs it in 1990, in New Orlean. Astor Piazzolla died on July 4,1992, when he was a most celebrated musician. Piazzolla's creative heritage includes over 1000 compositions. His music is performed by musicians of various styles, like violinist Gidon Kremer, guitarist Al Di Meola, cellist Yo-Yo Ma, pianist Arthur Moreira Lima, Kronos Quartet. This CD presents some of most popular Pizzolla's compositions. 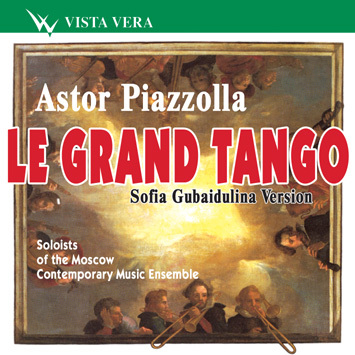 Le Grand Tango sounds in a version that was arranged by Sofia Gubaidullina for violin and piano. The substitute of violin by cello only emphasizes the sensuality of the music. My version of the Libertango was made for the outstanding Russian musician, bassoonist Valery Popov whose repertoire includes the music of all countries and epochs, from baroque to avant-garde. A four-part cycle, Invierno Porteno, Primavera Portena, Verano Porteno, Otoco Porteno is performed here by piano solo. A "black-and-white" timber version emphasizes the plastic of the music and the spice of the harmonious accords. Of six Tango-Etudes we left here only two, the first and the last. It is not because the rest are not good. We sacrificed them to maintain the general dynamics of the disc. Our idea was that one should listen to this disc from the beginning to the end at one breath. A piano miniature Zita represents a bright example of confluence of two Piazzolla's worlds, that of Bach and the world of tango. History of Tango cycle is represented here in different instrumentations. I made versions of first and third pieces for the Moscow Ensemble of the Modern Music when they were about to start their tour over Russia. A combination of four wind instruments including such "polar" as saxophone and bassoon appears non-standard, at least there are not too many analogues to it in the ensemble practice. Violinist Yaroslav Krasnikov made accordingly versions of even pieces of the cycle. He supplemented the wind instruments with violin and cello thus enriching the range of expression and emphasizing the contrast between the sections of the music.